Jill: Is it true a cat always lands on its feet? Puss in Boots: No! That is just a rumor, spread by dogs! The phrase “less is more” comes up a lot when dealing with particular characters that people tend to love. In Shrek 2, the character of Puss in Boots was first introduced and became an immediate favorite to many. 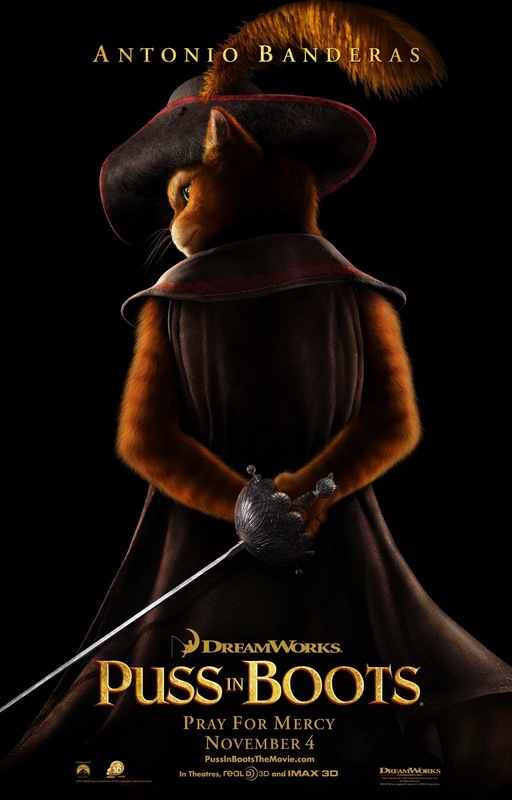 Given that character’s popularity and the fact that DreamWorks Animation has decided to milk Shrek for all it’s worth, it comes as little surprise that the swashbuckling feline was able to land his very own spin-off movie. Now, while my admiration for the Shrek franchise faded around the third film in that series, I felt fairly indifferent towards what to make about this newest addition. The film could have easily backfired by bringing a supporting player into the spotlight. Thankfully, I actually enjoyed quite a few aspects of this movie, mostly in the ways that it actually distanced itself from the pop culture reference-heavy Shrek films and stood as a fairly conventional, but entertaining adventure film. Antonio Banderas returns to voice the courageous cat known as Puss in Boots. The story is set well before Puss’ days as a loyal friend to Shrek, Fiona, and Donkey and takes the audience back to when Puss worked more or less as a mercenary for hire. Following some business in a bar, where those who would be quick to make fun of a kitty in big shoes are quickly hushed by his prowess with a rapier, we find Puss headed out to embark on a big score opportunity. His objective is to steal the magic beans from Jack and Jill (Billy Bob Thorton and Amy Sedaris), who are apparently murderous outlaws. While on the prowl, Puss encounters another mercenary, who screws up his plans entirely. Following the chase that naturally ensues, followed by an epic dance off/sword fight, Puss learns that his mysterious opponent is none other than Kitty Softpaws (Salma Hayek). To make things even more interesting, it turns out that Kitty is working with Puss’ former childhood best friend, Humpty Alexander Dumpty (Zach Galifianakis), who betrayed Puss years ago. The trio forms an unlikely alliance with the hopes of finding the beans. Despite this bond however, both romance and past betrayals may become factors that hinder the progress of their plans. I was surprised the most by how straight forward this film was. It is presented as an adventure movie that, while featuring the Puss in Boots character that people love, along with a number of other fairy tale characters, does not worry about cramming a lot of forced pop culture humor that littered all of the other Shrek sequels. Especially given the (humorous) trailers for the film that certainly suggested I was in for a pretty self-aware film, I was happy with the way it was actually presented. With that said, turning the film into a standard adventure tale that happens to be animated and feature familiar characters seems to have turned down the amount of humor that one would have expected. There is a level of wit and a good number of chuckles here and there, but not many scenes that I found to be incredibly funny. However, with the focus on grand adventure themes, it makes sense in an “after the fact” sort of way. Given that only so much can be stated regarding whether you will laugh at this film or not, there are two other main focuses I will bring my attention to. The first is the casting of this film. Banderas once again has a lot of fun bringing what can only be described as Latin sensuality to the glory-seeking feline. The Puss character, even in a film where he is the main star, has enough charisma without being overbearing, which makes him quite entertaining to stick with throughout the film. Hayek fulfills the role of the requisite female interest and her friendship/film history with Banderas makes it seem like a pretty natural decision. The most surprising aspect out of all of this was Zach Galifianakis’ role as Humpty. Yes, he is an egg and it is silly (and the movie is aware of this), but for whatever reason, the film wanted to bring a lot of pathos to this character and Galifianakis was more than up to the challenge of relating that to the audience through his voice work. It is hard to describe, but I was quite impressed with how this character was handled overall. The other area worth discussing is in regards to the animation. In a nutshell, everything looks great. This is a big tent pole DreamWorks release; clearly they know what they’re doing at this point and make the whole film look pretty fantastic. From the little details to how this film manages to capture scale, with a few key sequences in mind, such as the giant beanstalk. My friend and I decided to not go 3D this time around (does this matter? ), but I was pleased just fine with the look of this film. I was also quite pleased with how this movie handled action. The various sequences may not have been as spectacular as those seen in Kung Fu Panda 2, but they delivered just fine. I got enough good out of this film to be happy that my indifference was matched with an enjoyable adventure. I don’t think anything really stood out in Puss in Boots to make it a film that I want to revisit down the road anytime soon, but it does have a lot of worthwhile aspects that make it fun and enjoyable for many. This should be especially true to anyone that has not been burnt out on the Shrek franchise. I do not necessarily want other characters in the Shrek universe to have spin-off films, but if they were to distance themselves in the same way that Puss in Boots does, then I would at least have admiration for the direction taken. Puss in Boots: My thirst for adventure will never be quenched!